Jeff, Zoltan – Thank you. Let me start by offering my warmest gratitude to the entire Golden Door Host Committee for their generosity, and especially to Noubar Afeyan and Bob Millard for their inspired leadership. To the wonderful people who were somehow persuaded to say nice things about me by video, I am humbled and grateful beyond words. And I’m deeply grateful to all of you for coming out tonight and for supporting the International Institute of New England in its important and vital mission! This evening has been overwhelming. It is hard to come to this stage from a place like MIT and believe that I should be up here alone receiving this award. You saw and heard the MIT professors in the video, including the one who received the Nobel Prize! And the fact is that they are “MIT normal” – because 40% of our faculty and 40% of our graduate students were born outside the United States. And even beyond MIT, my story is such an ordinary American story, such an ordinary human story. It is the kind of story that begins all over again for someone new every day, in many cases with help from this impressive organization. So many immigrants who go on to succeed began with far more challenges than I had. And I am certain everyone in this room has a unique story of their own. However, since the IINE did kindly decide to give me this special honor and this opportunity, I would like to reflect briefly on the experience of immigration – and on its vital role in building and nourishing American society. Technically, I have only been an immigrant for about two-thirds of my life. I arrived in the US as a graduate student in the mid-’70s and became a naturalized citizen in the late 1990s. But looking back, I realize that I have no idea what it feels like to be “not-an-immigrant.” I have always felt like an immigrant, even in Venezuela, where I was born. I grew up in Maracaibo and Caracas – but my parents were refugees from Eastern Europe. In the late 1930s, they observed the rising threat of Nazism. They had no money, almost no education and a new baby, the eldest of my three brothers. But they made the painful decision to leave, to escape one spring day in 1938 – leaving behind everything they knew, including all 52 members of our extended family who were taken that summer to a ghetto and then to a concentration camp, where 51 of them died. Mercifully, the country of Ecuador allowed my parents in. By the time I was born 12 years later, we were settled in Venezuela. Yet we were still struggling. My mother never spoke Spanish well, so our whole household was a mix of Yiddish and Spanish, neither quite one thing, nor the other. I should be clear that, in Venezuela, I was never made to feel uncomfortable for being the son of immigrants. But what I did feel, sometimes, was anti-Semitism, occasionally manifested in fist fights and personal violence. Walking home from school was, on occasion, an adventure. And the result was that, although I was Venezuelan by birth, often I was made to feel by some that I did not truly belong. And I certainly felt like an immigrant when I arrived in California for graduate school! During my first term, I had two major strikes against me: I didn’t speak English, and I was not academically prepared for graduate studies at a top US institution. As a result, I simply couldn’t understand the lecturers in the classrooms. So I would sit in class, desperately trying to write down what I was hearing - phonetically. And then after the lectures, I would spend endless hours in my room in the evenings, with the textbooks and a dictionary, trying to figure out what on earth the lectures had been about. Many months later, I finally found the courage to prepare a question in advance, to ask in class. And I asked it. And then the professor answered me…with a question! Which of course I could not understand! But I am not telling you this story because I want your sympathy or your admiration. I am telling it because it points to something fundamental about why immigration is such a deep source of strength for America. During that first year in graduate school, I was very close to quitting. I almost went back to Venezuela. But I didn’t. Partly, I was too embarrassed to quit. After all, one of my older brothers had already come to America and earned a PhD. But I also knew that the only path I had to a better life was to make myself stronger and better – to get all the education that I could. And when you’re an immigrant, and you feel like giving up, it is that drive that gives you the power to struggle, and struggle and struggle – until you succeed. You don’t have to be an immigrant to have that kind of drive – but that unstoppable energy is the essential story of America. In a sense, I never felt that I truly belonged almost anywhere. Perhaps that is a good thing: I have always felt grateful to my home country, whether Venezuela or the US, as I was allowed to live there. I didn’t (and don’t) take that for granted. You will not be surprised, however, that there is one place where, for me, the feeling of being an outsider goes away. When I arrived at MIT in 1980 as a young faculty member, I still had a funny accent. And I still came from far away. Plus, I had no idea how to cope with snow! But at MIT, there were so many brilliant, humble people who had come from somewhere else that I could “feel like an immigrant” – and fit right in! 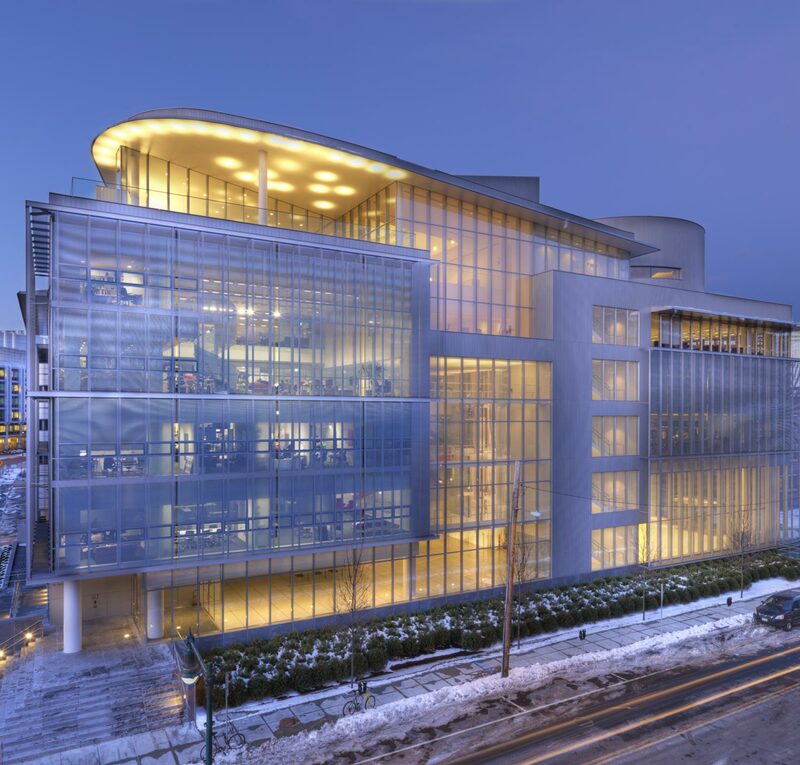 With absolutely no sense of contradiction, MIT is profoundly global and profoundly American. It is an open, daring, creative community of human beings from every nation you can think of, united in working on big ideas and deep human problems to make a better world. I felt welcome immediately, and I have felt that way ever since. As I have discovered through 40 years in academia, the hidden strength of a university is that every fall, it is refreshed by a new tide of students. I am equally convinced that the genius of America is that it is continually refreshed by immigration, by the passionate energy, ingenuity and drive of people hungry for a better life. Each immigrant’s personal history is a signature American story. Multiplied millions of times, they are the story of how America became, and remains, optimistic, open-minded, innovative and prosperous – a story of never-ending renewal. In a nation like ours, immigration is a kind of oxygen, each fresh wave reenergizing the body as a whole. As a society, when we offer to immigrants the gift of opportunity, we receive in return vital fuel for our shared future. At this moment of turmoil in our nation, these observations may sound old-fashioned or naïve. But I am as certain that we must continue to fight for these ideas and values as I was certain, in graduate school, that I could never afford to give up. It is a tremendous honor to be here tonight in the presence of so many people who share these values and who have made this cause their own. Before I conclude, it will not surprise you to know that I have a partner who helps me and supports me in everything I do, and she is my wife, Mrs. Chris Reif. I have also enjoyed the support of my three brothers, all my life, as I am the youngest, and the love and inspiration of our children, Jessica, who is with us tonight, and Blake. There is no bigger inspiration to try to make a better world, than children and grandchildren. To everyone here, from the bottom of my heart, and in honor of my parents, my original immigrants, thank you for this celebration, and especially for all you do for all of us!